I went to the preview today of an auction of Impressionist and Modern Art at Christie’s. It made me think I should go to see art at auction houses more often. What you don’t get is a curated exhibition, with the pieces arranged around some kind of (hopefully) illuminating theme. It’s a rather random selection of work determined by what happens to come up for sale. But there’s no entry fee, the paintings are well-displayed, it’s less crowded than exhibitions at major London galleries tend to be, and the staff are more deferential, even though they must have taken one look at me and realised that I was unlikely to be splashing out a few million quid for a Renoir. And the catalogue (expensive, but there are copies chained around the place for you to consult) gives loads of information about the work. There were some nice paintings, too; Cezanne, Picasso, Miro, Kandinsky, Degas, Modigliani and so on. I rather liked Portrait d’Eugène Lamy by Gustave Caillebotte and this bull by Oscar Dominguez, for example, as well as some nice Vuillards. Most unexpected item: Giacometti chairs. Isn’t that horrible? It’s interesting, though, trying to get some sense of who’s hot and who’s not in the current art market. Despite the price tag on that one, Renoirs were generally estimated at less than I expected; the Schieles on the other hand were pretty expensive. It would be quite interesting if places like the National Gallery had valuations displayed on the labels. Would you be able to resist being swayed by the number of zeros? Of course they’d never do something so vulgar, and they’re probably quite keen to appear above such things, but I’m sure museums, academia and the art market have a symbiotic relationship. If an artist’s reputation is on the rise, I’m sure curators and collectors are affected in much the same way. “Marshmallowy” is a great description of that Renoir, Harry. Someone mentioned to me last week that he often goes to Sotheby’s, so I think I should go with him on his next visit to an auction. 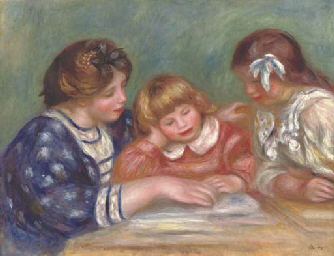 Renoir seems to have someone who occasionally produced great paintings despite himself. Ha! I learn from the paper today that the Renoir failed to sell. I thought it was overpriced.